Aloe Vera is a perennial, shrubby and succulent plant that has green leaves arranged in a rosette pattern. The leaves can retain water with high capacity enabling the plant to survive in harsh circumstances such as drought and warm dry climate. Aloe plants have been traditionally used to treat wounds since ancient times and are mentioned in the Ebers papyrus, an important medical text of ancient Egypt, dating from 1550 BCE. Among different aloe species, aloe vera is considered to be the most active, commercially important and the most researched. Different parts of the plant have about 75 different nutrients, more than 200 active compounds such as sugars, amino acids, enzymes, minerals and vitamins, saponins, lignin, anthraquinones, and salicylic acid. A plant is well known for its antioxidant, antidiabetic, anti-inflammatory, sunburn relief, immune boost, anti-ageing and anticancer properties. Because of its specific composition, many industrial applications of aloe vera have been introduced. Aloe vera is Aloe barbadensis. Other names include: Aloe chinensis, Aloe elongate, Aloe indica, Aloe officinalis, Aloe perfoliata, Aloe rubescens, Aloe vulgaris Lam etc. Origin: Aloe is a large genus with 446 species that belongs to the Xanthorrhoeaceae. Aloe spp. grows wildly in the tropical climates around the world particularly South Africa, Madagascar, Arabia and the Canary Islands. They are cultivated mainly for medicinal and decorative purposes. Botanical drug used: Gel extracted from the internal tissues of the succulent leaf. Although many biological investigations have been performed to reveal the active constituents of Aloe spp., it is still not yet completely clear which compounds are responsible for the various observed pharmacological properties. However, polysaccharide and glycoprotein (lectin) fractions of Aloe spp. have been reported to possess considerable bioactivity. Several constituents from various phytochemical categories including alkaloids, anthrones, flavonoids, chromones, naphthalenes, glyocoproteins and pyrones have been isolated from various Aloe spp. 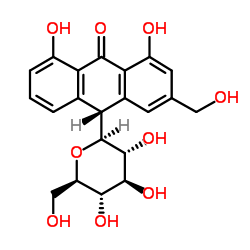 Aloin, aloesin, aloenin, aloeresin, aloe-emodin and chrysophanol are some examples of such bioactive compounds. Aloe gel which is derived from the succulent leaves of the plant. Aloe gel is widely used in cosmetics, medicinal products and food supplements, and polysaccharides are its major constituents. Linear chains of glucose and mannose molecules, ranging in size from a few to several thousands of residues, form the polysaccharides. Due to the predominance of mannose to glucose, these polysaccharides are referred to as polymannans. About 98.5% of the pulp and 99.5% of the gel or mucilage content is water, the remaining 0.5–1.0% ingredients include over 75 various compounds such as polysaccharides, anthraquinones/anthrones, carbohydrates, chromones, phenolic compounds, minerals, enzymes, water-soluble and fat-soluble vitamins, minerals, proteins and organic acids. 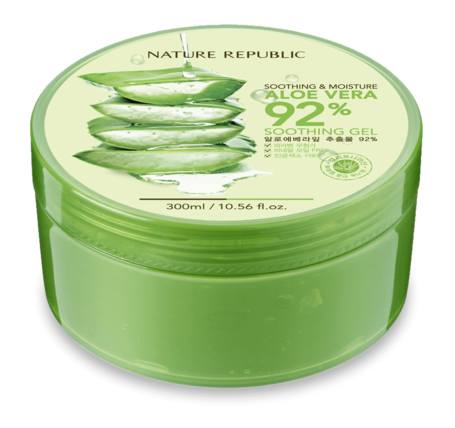 Aloe vera gel is applied externally to treat skin irritation (such as from insect bites), burns, psoriasis, wounds, radiation dermatitis and frost-bite. It is also frequently found in cosmetic preparations, usually at low doses. Internally, aloe ‘juice’ is taken as a general tonic to enhance the immune system and to treat constipation. Aloe has also reported antidiabetic, anticancer and antibiotic properties. Most clinical uses are based on anecdotal data. Data from small trials suggests effectiveness in healing first- and second-degree burns and increased survival of frostbitten tissue. Aloe Vera has been demonstrated to lower blood glucose and lipid levels in diabetic patients with hyperlipidaemia and patients with metabolic syndrome. There is a lack of evidence based on high quality clinical trials to support the topical use of aloe for treating acute or chronic wounds. Despite the paucity of evidence, data from a few other small trials suggest that topical Aloe vera may be effective in healing firstand second-degree burns, although these conclusions should be treated with caution. 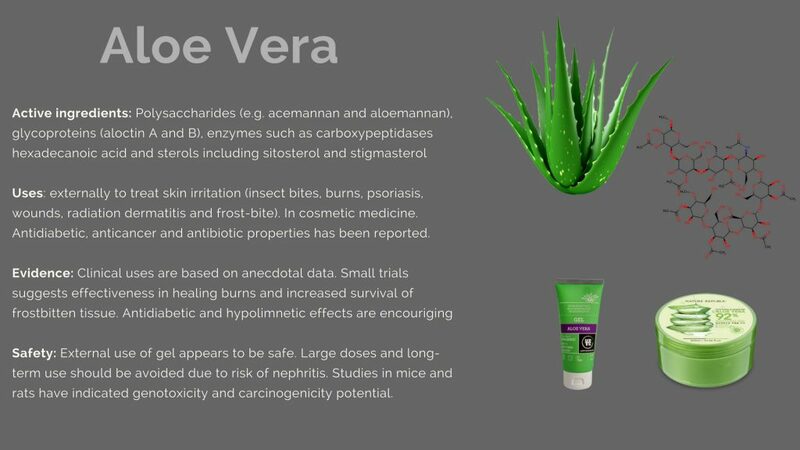 In vivo studies in animals have indicated that Aloe vera may accelerate wound healing and prevent progressive dermal ischaemia caused by burns, frostbite and electrical injury by inhibition of thromboxane A2. Topical application of aloe has been shown to significantly enhance survival of frost-bitten tissue in both rabbit ears and in a clinical trial in humans. In two randomized double-blind placebo-controlled clinical trials, aloe leaf gel demonstrated significant lowering of blood glucose and cholesterol levels, including low-density lipoprotein cholesterol (LDL) levels in hyperlipidimic type 2 diabetic patients and patients with prediabetes/ metabolic syndrome. In another trial, oral aloe gel produced a beneficial clinical effect greater than placebo in patients with active ulcerative colitis. Antipsoriatic effects have been demonstrated in mice and the polysaccharides and glycoproteins have in vitro and in vivo immunomodulating and anticancer effects hexadecanoic acid has antifungal effects. Taken internally in large doses, aloe preparations are known to cause nephritis. Two cases of acute renal failure have been reported following aloe administration. It may also precipitate allergic reactions and has been associated with gastrointestinal complications (colonic injury). Two acute cases of hepatitis have been associated with internal use of Aloe vera. An in vivo study in mice demonstrated a weak enhancing effect of aloe gel and aloe whole leaf on the photocarcinogenicity of simulated sunlight. Other in vivo studies have indicated that A. vera whole leaf extract is a gastrointestinal irritant in mice and rats, and carcinogenic in the large intestine of rats. A report of an interaction suggests that taken internally, ‘aloe vera tablets’ may interact with the anaesthetic sevoflurane, increasing its antiplatelet effects. However, the composition of the preparation was not stated and no other interactions have been recorded. 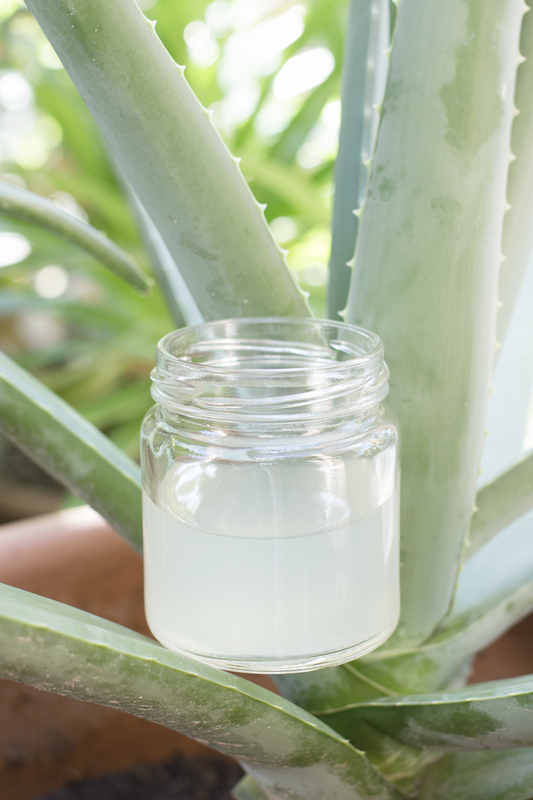 Aloe Vera gel may enhance the absorption of low bioavailability drugs. Vitamin C and E oral bioavailability has been investigated with Aloe Vera gel and it leaf extract. Vitamin C absorption was found to be reduced with both extract and gel consumption. But, the overall bioavailability of these vitamins was increased. The proposed mechanism of action is proposed to be the degradation protection as well as binding to polysaccharides which results in slower absorption rates. Its contraindications include allergy to any of the constituents. While external use during pregnancy is not thought to be of concern, internal use of aloe vera gel and whole leaf aloe extracts should be avoided during pregnancy and breastfeeding, due to their gastrointestinal stimulant and genotoxic effects. be followed and large doses or long-term use should be avoided. Amino acids of Aloe Vera are considered the most important for its wound healing effects. Aloe Vera also contains various inorganic electrolytes including iron, chromium, potassium, magnesium, copper, zinc, sodium and calicum which are an essential part for wound healing process. Many studies proved fast healing of wounds after Aloe Vera treatment. Aloe Vera may also prevent formtion of scars during skin injury after stimulating the production on cells and promoting the regeneration at the deepest layers of the skin. Aloe Vera gel has also a good potential to cure and prevent gastric ulcers via different mechanisms such as anti-inflammatory properties, mucus stimulation, healing effects and regulation of gastric secretions. One study has reported that myrrh and aloe based gels are effective in decreasing ulcer size, exudation and erythema. At concentrations of approx 80%, this plant can be successfully used to treat skin ulcers such as mouth and leg ulcers and cold sores. Aloe Vera gel has a strong anti-inflammatory acitivity because of the presence of compounds such as anthraquinones and chromone. Oral aloe vera gel in the concentration of 2% has been shown to be active in decreasing the pain severity and wound size in patients with aphthous stomatitis. The Aloe Vera anti-inflammatory effect has been also observed in relieving joint pain. It is known that bradykinin can cause painful inflammation in response to different types of injuries. Studies have found that Aloe Vera has anti-bradykinin activity as it contains an enzyme bradykinase, that metabolizes the bradykinin and therefore reduces the inflammation. Aloe Vera contains glycoproteins and polysaccharides which makes it a potent chemo-preventive agent that may be useful against different types of cancers. These compounds may stimulate the immune system to fight against cancer. Active ingredients from Aloe Vera: barbaloin, aloesin and aloe-emodin extracted from Aloe Vera have been shown cytotoxic effects against acute lymphocytes leukemia (ALL) and acute myeloid leukemia (AML) and cancerous cells. Aloe Vera gel has been also shown to be an effective antihyperglycemic agent against type 2 diabetes. Aloe vera gel lowers the blood glucose level without affecting the normal lipid levels in blood and liver or kidney function. It has been suggested that hyperglycemia is lowered due to increased glucose metabolism. One study reported reduced insulin resistance and reduced body weight and in diabetic patients treated with Aloe Vera gel. The antidiabetic activity has been also reported via reduced oxidative stress and improved antioxidant status. Another study showed 44 % reduction in glucose levels in blood that was achieved in diabetic patients who used with Aloe Vera gel. Similar results has been seen when Aloe Vera gel was used together with glibenclamide. Aloe Vera gel is consiedere to have antihyperlipidemic activity. When it was given to the patients who were not responding to dietary interventions, it very effectively reduced the cholesterol levels in blood (15.4%), “bad” LDL cholesterol (18.9 %) and triglycerides (25.2%). One research showed that the combination of Aloe Vera gel with probiotic Lactobacillus rhamnosus may improve the lipid profiles in rats with hypercholesterolemia together with enhanced production of cholesterol and absorption which may result in lowered risk of cardiovascular diseases. Aloe Vera gel is known as the one of the most potent laxative agents and is used to treat constipation. When taken it is taken in doses of 0.25mg, effects start fast within 6 to 12 hours resulting in loose bowel movements. Aloe vera gel is also safe for nursing mothers, and no laxative effects were found in their infants. Genital herpes is known as the one of the most common sexually transmitted diseases. Management of this disease involves drugs for faster healing of lesions and sores so that outbreaks can be prevented or reduced. Aloe Vera extract in the concentration of 0.5% as a hydrophilic cream has been shown to effectively treat genital herpes in men with a rapid healing process.